Two Half Days then the SoHo…. 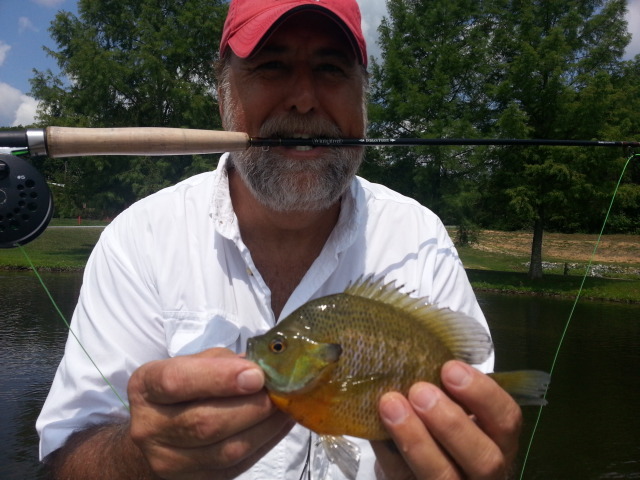 Wednesday, July 30, 2014…….Busy start to the week, have been doing some local in the backyard type of trips and lessons/instruction this week, on Tuesday did an early AM casting lesson, Gregory Boggess, and then a 1/2 day with Greg, we fished some local water and caught some nice bluegills on the fly, practicing making long throws with accuracy. 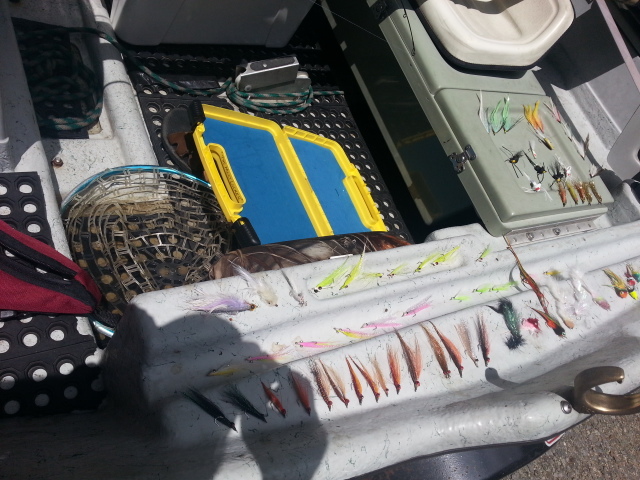 Great did a great job, we put a bunch of fish in the boat. 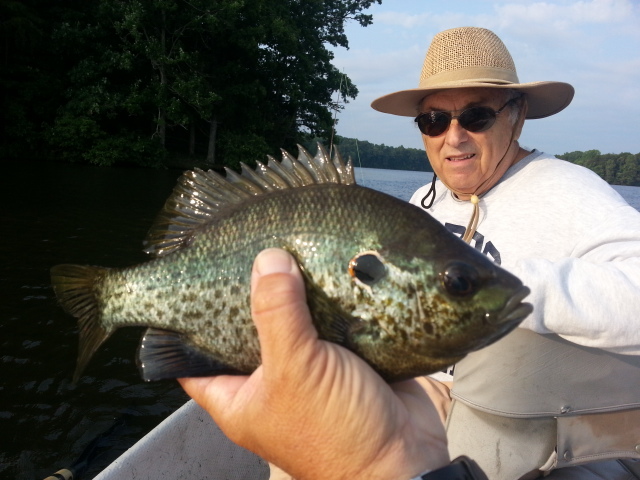 Today, Wednesday, I got another early start, did a 1/2 day local trip, Larry Tomar, Greensboro, NC, great morning, cool weather has turned the fish on big time, Larry had a great half day putting almost 50 in the boat, a mix of shellcrackers, bluegills, yellow perch, redbreast, all on flies….the infamous and deadly RLD did them in once again….two of the shellcrackers were huge, one would have come really close to a lake record……we were on Higgins….. fished til 130pm and called it a day…….right as it started to get hot. 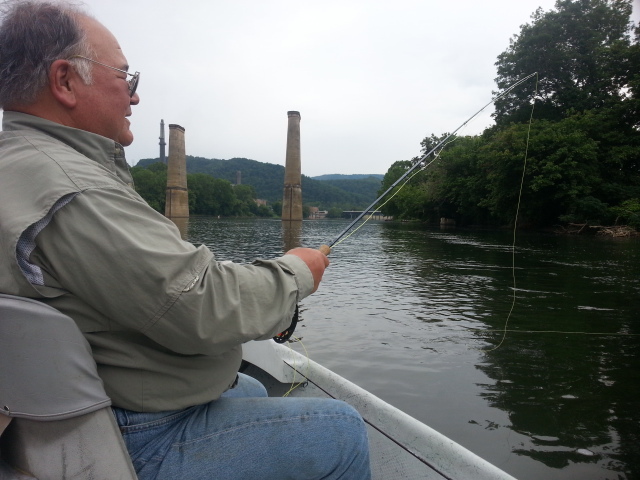 Will be doing a day trip on the South Holston tomorrow, fishing has been decent there, a smattering of midges, some beetles and ants, and a little sulphur flurry will likely be in the mix. I will be guiding Jack Harrington and Kelly Harrill, Greensboro, NC, and we’ll enjoy a full day on the SoHo and hopefully some nice cool weather. Highs are forecast to be below 80F which ought to be fantastic. I love days where you can fish in all day sun and not break a sweat. Is today that day? Maybe. Will round out the week with a couple of floats, smallmouth, and will be with Bernd and Nicole Druebbisch, Greensboro, NC. Hope we can escape the storms /wet weather as the end of the week could be soggy. Hope not. But it could be. On a closing note, I have a lightly used Renzetti Traveler Vise for sale, the vise retailed for $169 and has a Pedestal base, standard jaw, and has a $49 visual enhancement backdrop plate on it. Retail its over $200 of goods, you can own it for $139.00. 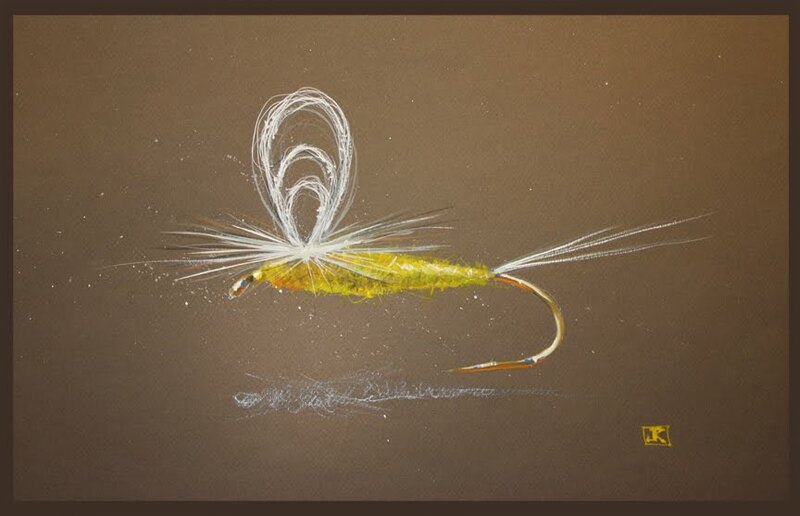 This guy was over a pound and a half…………and he ate one of my favorite summer flies..the leadeye RLD…. Fri. July 25, 2014….That is the mantra or has been for the past month. We have had hot, cool, everything in between, drought in places, heavy rains in others…its been all over the place. We’ve been all over, from small waters to the TN tailwaters to the Smith in VA to the several smallmouth waters we guide, float, and fish. Not short on variety or change lately. Been a bit tardy on posting reports, a lot going on, some of it trying to stay consistently in decent fishing with all the weather woes. But we need rain, and great to get it when we do. So like the fishing, we take what we can get. 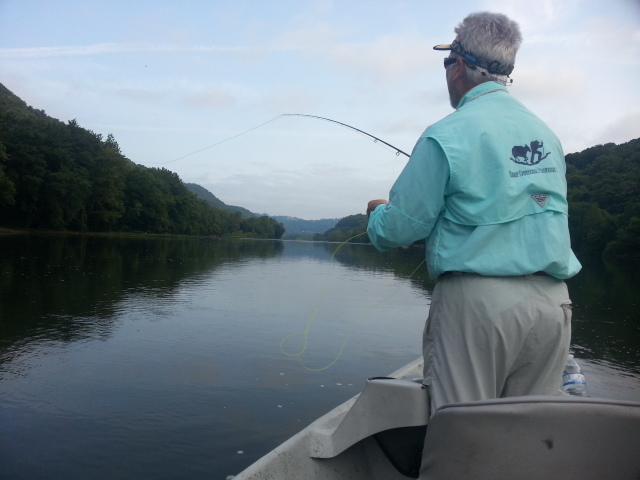 Things continue to be all over the map in terms of conditions and fishing, the TN Watauga and SoHo have been decent, minimal releases on the South Holston , a deviation from the normal summer high water float season. Sulphurs have been hatching, but confined to the upper 2 miles of river for the most part, as the water temp is the key thing. 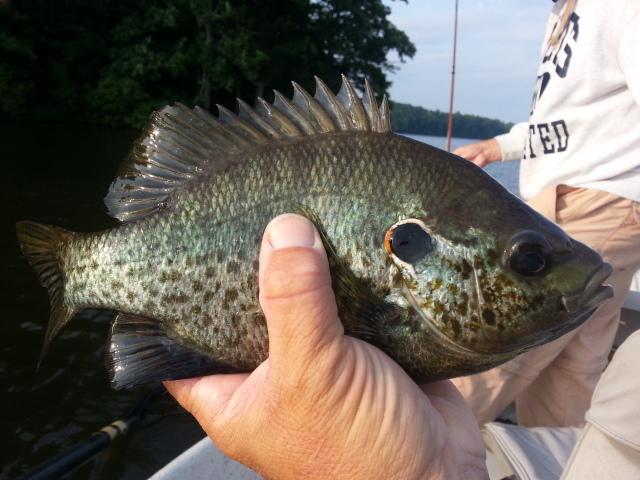 Some spotty hatches on high water, the few times they have released, but spotty is the key word. Low water fishing for sulphurs has been good on some days, less so on others. 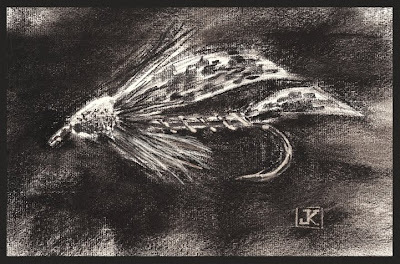 When not on sulphurs, midges and scuds have worked well, and the terrestrial bite continues to be pretty good on both rivers along their entire lengths. 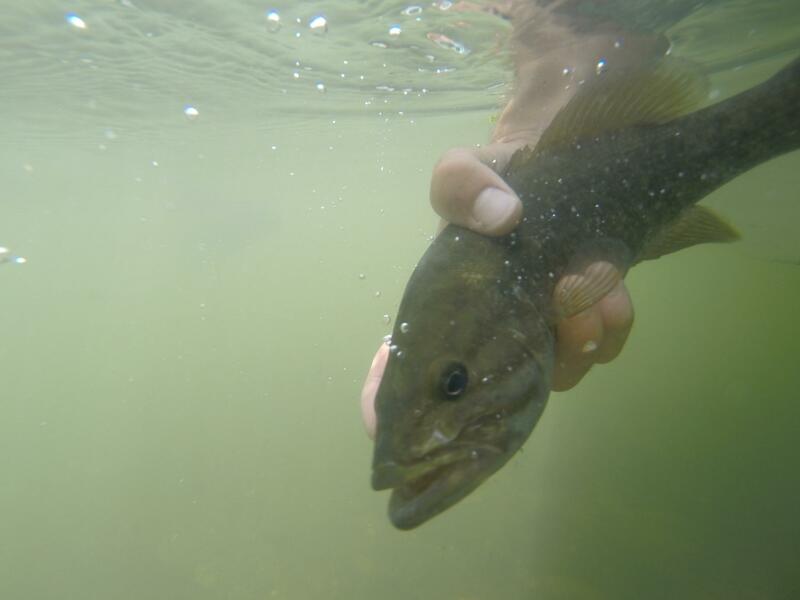 Bass and panfish locally has still been good, surprising there’s lots of clear water even with recent storms. 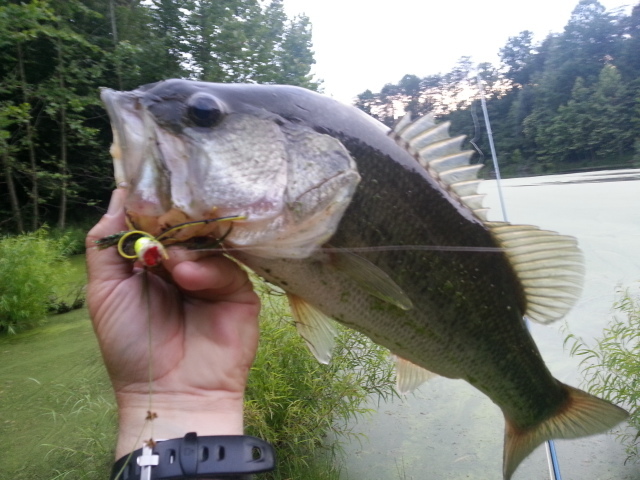 Recently the bass have hit poppers pretty well, and good action early and late. Lots of damsels out and about, and that always gets them looking up. My son Ben has been home from Wilmington this week, he did well at a friends pond on some bass, landing about a dozen and one that was about 4 1/2 pounds, all on a popper. Redfish and flounder on Monday, largemouths on Tuesday, and smallmouths on Thursday…..he had a rough week. 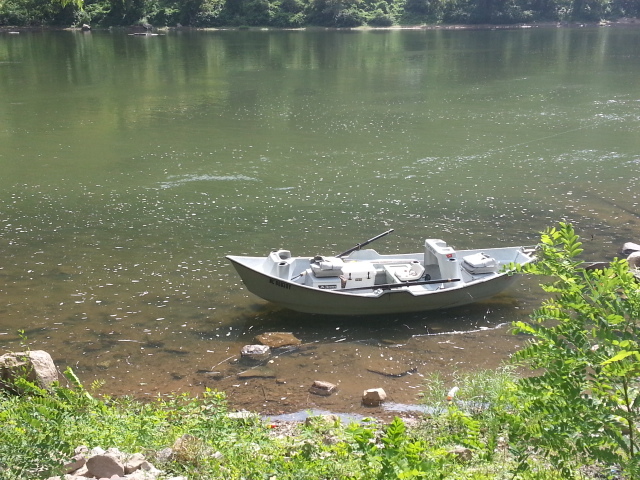 Did a recent float with Mike Callahan, a good friend and fly manager at Great Outdoor Provision Co, we did a VA/WV float, Mike and I got an extra early start, we fished near the VA/WV border , the water is clearer there, even though a long haul from our area. But we went where the clear water was. 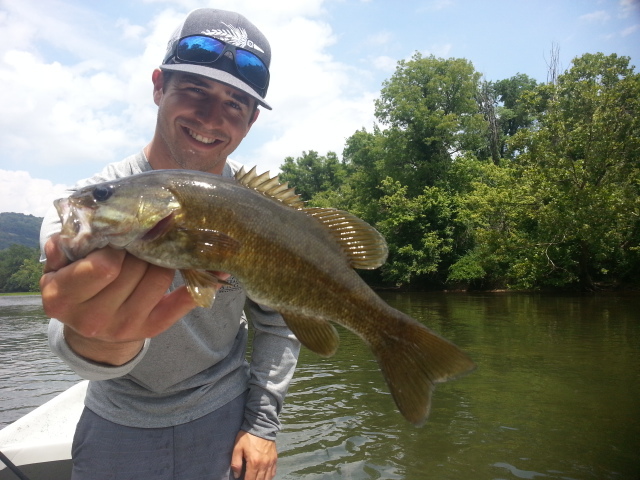 It was slow to start, we caught only a few, maybe 3 or 4 smallmouth at the first stretch we fished, some on poppers, others on hardware…..but things picked up for us considerably the second half of the day. It was hot, 87F to be exact, and we had all day sun. Had hoped the clouds would help us out, but they didn’t stick around. The forecast was for thunderstorms but they did not materialize. We hit one stretch where we banged them pretty good, I’d say we landed probably around 35-40 smallies….many more on that came off. We also saw a lot of fish out in the open, plainly visible, one thing that had been non existent for the past week. The area we did pretty well in holds a lot of fish but they are deep, making them very difficult to target and catch. But in that spot we put probably 25 in the boat just there. We fished all the way to takeout, Mike caught our last fish fishing some deep ledges , and it smashed a popper. 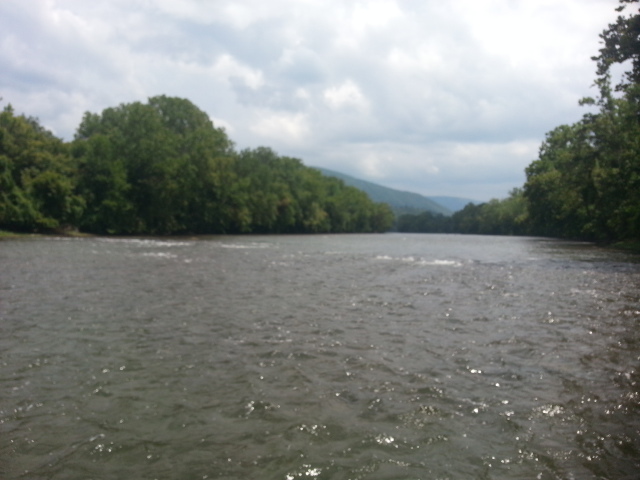 Then we floated to take out just down river. 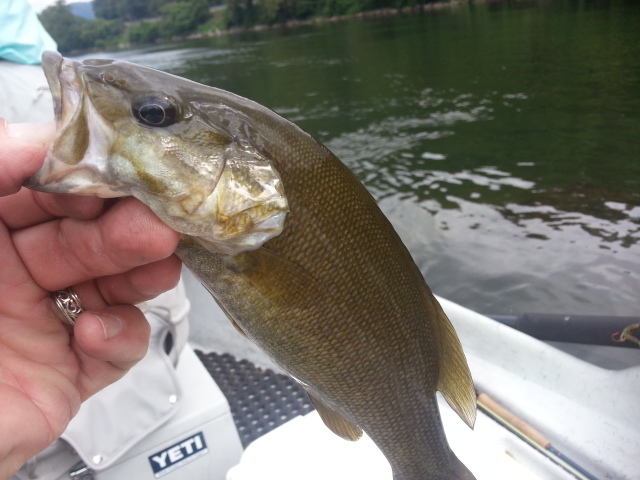 Saw one of the heaviest hatches of sulphurs ……..some of the smaller smallmouths and redbreast and redeyes were rising to them. Rivaled what you’d see on the Holston, just no trout there rising to them…..
Also finished up our GTCC Beginning Fly Fishing Class, final session, good class, a truly great bunch of folks…. 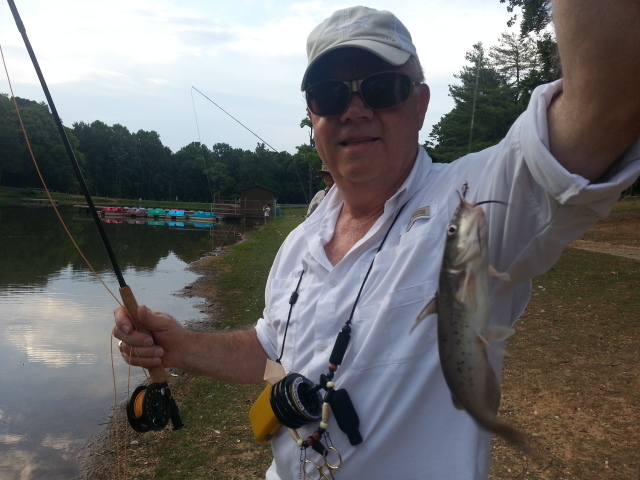 Spent some time fishing with students and everyone caught fish, Steve Beasley took honors for big fish with a catfish…..catfish on a fly…gotta love it. We had recent bad weather put a damper on our class field trip twice, so we’ll be redoing it in October with promise of cooler weather and fishing some stockers so everyone can get into some fish. Took yesterday to do a smallouth/musky float with my son Ben, his birthday trip, along with his new 10 weight rod from his mom and I ….we christened it, and had hoped to do it with some musky slime, but we didn’t see or turn a fish where we’d caught some previously. Not the best conditions for it, and before leaving for the trip I wondered if the cold front coming through and the heavy thunderstorms firing with put a damper on the fishing….which stood the real possibility of giving us some muddy conditions not just from rain we might get but from rains of Tuesday and Wednesday. 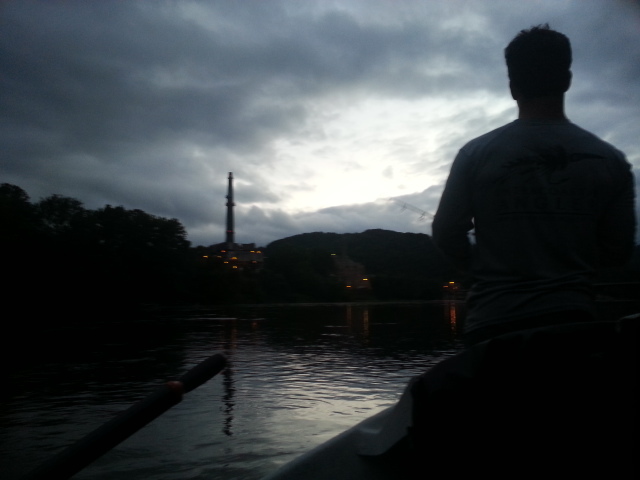 Things played out pretty much like I thought, but we did get a few hours of fishing in before the rain/storms hit. Things were really slow to start, I was starting to think maybe we should have made different plans. We hit it hard, worked our wazoos (is that a word?) off, and my son Ben put about 2 dozen smallies in the boat, the water was very off color when we got there, the morning release from Claytor reached us, and that cleared things a little, but then the rain/storms hit and the runoff from yesterday’s rains came upon us, plus that mixing with another release from Claytor dam and by then it was a wash. Fishing was slow at first, but decent from 10 til about midday, Ben certainly worked hard for every fish. Holding him in spots to cast was difficult, some areas are too fast to anchor or not safe to do so, so we hit holes in the rapids just with me holding him by rowing. So we worked for every fish. The water was stained at best, we had about a two hour window when the release pushed some of the dirty water out but it quickly got that way again as the next water release came and some runoff made its way in from way upstream, mainly from two trout stream tribs, Big Walker Creek, and Stony Creek. We sat bankside under some low trees, actually right on one of our favorite musky holes, one that produced a 45″ fish last fall for my son Ben…it rained …..and rained…….and rained….. We got a 10 minute respite, then another line of heavy showers moved through and I rowed a stiff wind a driving downpour for a solid hour to make it to the table rock rapid (what locals call it) and we floated on to take out. It turned off windy and cool as the cold front pushed past. Temperature dropped about 22 to 25 degrees. I imagine there will be a sizeable release from Claytor on Friday and the fishing will be off for a day or so. It was still a fun day, we got drenched….but hey we needed the rain. We need it so badly in SW Va, really a lot of places in VA, that I am glad to see it. Even if the tradeoff is fishing that is off because of it. One thing about summer is things rebound quickly, and you are back to fishing soon. Had a float scheduled with Ken Teague, Winston-Salem, NC, and based on yesterday’s weather and likely releases today we postponed , will likely make it up soon. The water when we took out near the WV line yesterday was up about 1700cfs, running fast, and very colored and getting muddy. There’s about a 18 -22 hr window when runoff mixes in and you get a dam release from Claytor dam in Pulaski County, 22 hrs upstream from where we were. So calculating water conditions is a bit like an algebra equation. This plus that times something else equals…….. if it looked like it did when we floated to our take out, Friday’s conditions likely would be ramped up a bit over that. A No go. Been there, done that. Take a large river like the lower New, add a dam release, then some runoff, you have some Class I /II water (normal) here that can become II/III in an instant. 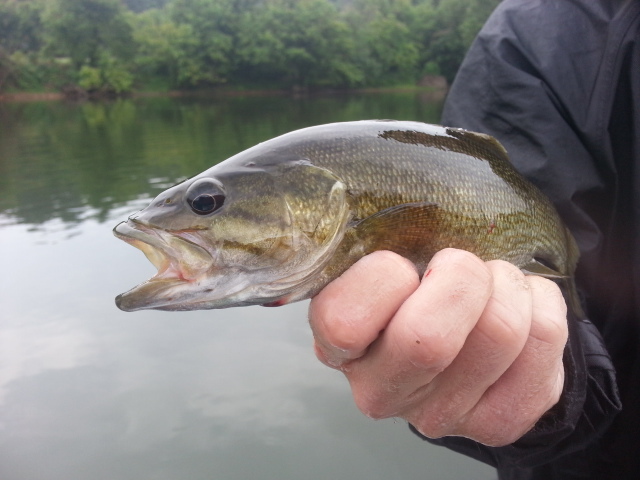 Several of our summer floats for smallmouth are like this. One plus though, is after thunderstorms and dam releases the ‘slug’ of cooler water, usually cooling off several degrees, turns the fish on somewhat. This is why if there are releases, even significant ones, we often still go. But a large release, and runoff mixed in with it, not good. Have a busy schedule coming up, a few days remain open early August on our calendar before I head to Wyoming to guide groups for the remainder of the month. The terrestrial bite is good, if walk and stalk and fishing dries is your game some good opportunity is there. 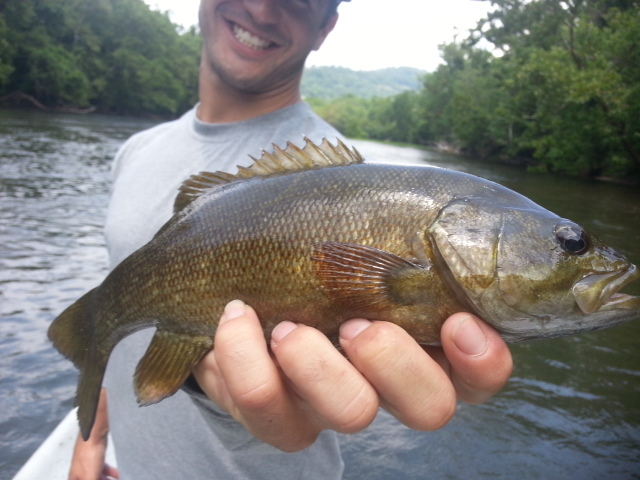 Also, smallmouth action remains good and should still be then. 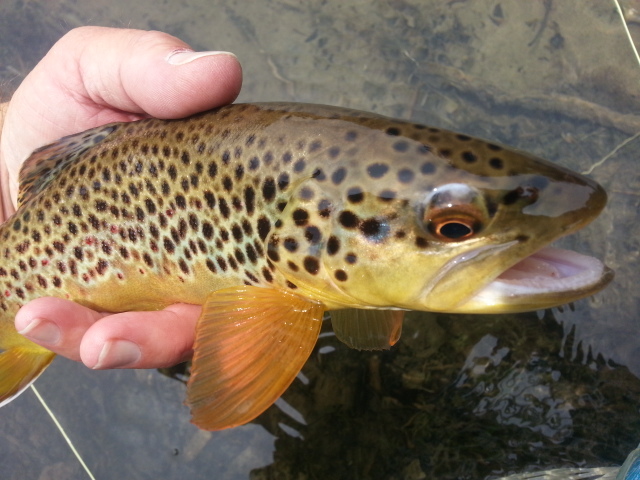 The lower New gets really good late season as the grass starts growing and the fish begin to look up. We’ve seen the start of that and it only gets better from here on out. And for those wanting a short or close trip, we do summer trips to the Smith (great terrestrial fishing), small streams, and local bass /panfish. 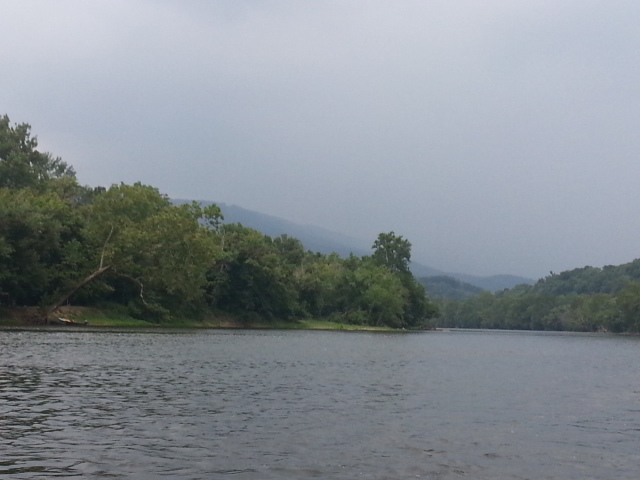 Things dry out a little after getting them drenched in yesterday’s heavy storms on the lower New River…..fun!